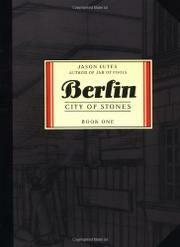 This black-and-white historical narrative, written and illustrated by Lutes, collects eight volumes of his ongoing comic book set in Berlin during the late ’20s. It’s a multilayered tale of love and politics at the beginning of the Nazi era, as Lutes follows the stories of three characters: a 20ish art student from the provinces, a textile worker, and a young Jewish radical. Their lives intersect in only the subtlest way—Lutes depicts them crossing paths at some great public events, such as the Mayday march that closes this part of his book. And Lutes plays with perspective in a visual sense as well, jumping from point-of-view frames to overhead angles, including one from a dirigible flying above in honor of the Kaiser. At street level, Lutes integrates his historical research smoothly, and cleverly evokes the sounds and smells of a city alive with public debate and private turmoil. The competing political factions include communists, socialists, democrats, nationalists, and fascists, and all of Lutes’s characters get swept up by events. Marthe, the beautiful art student, settles in with Kurt, the cynical and detached journalist; Gudrun, the factory worker, loses her job, and her nasty husband (to the Nazi party), then joins a communist cooperative with her young daughters; Schwartz, a teenager enamored with the memory of Rosa Luxembourg, balances his incipient politics with his religion at home and his passion for Houdini. The lesser figures seem fully realized as well, from the despotic art instructor to the reluctant street policeman. Cosmopolitan Berlin on the brink of disaster: Lutes captures the time and place with a historian’s precision and a cinematographer’s skill. His shifts from close-ups to fades work perfectly in his thin-line style, a crossbreed of dense-scene European comics and more simple comics styles on this side of the Atlantic. An original project worth watching as it shapes up to something that may be quite magnificent.